This has been a long school vacation for me. 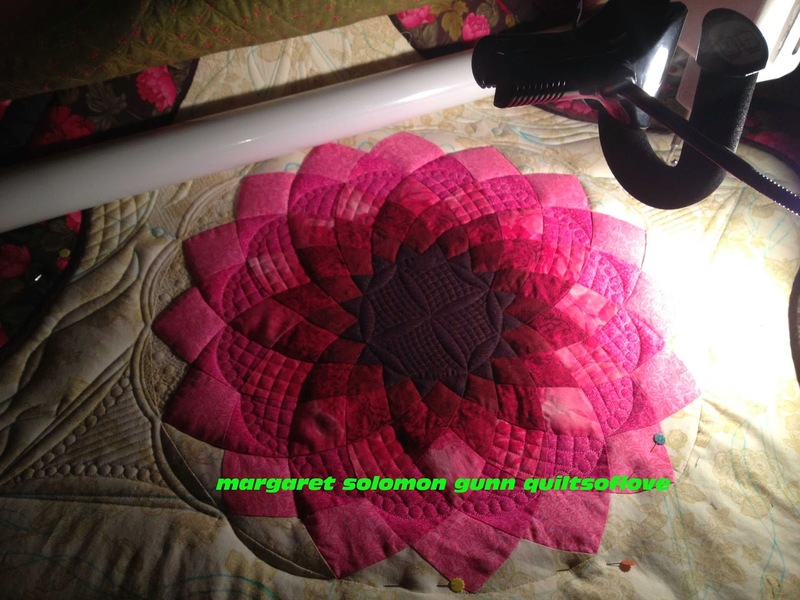 I am SO ready to get back to working on the quilt that is started on the machine. 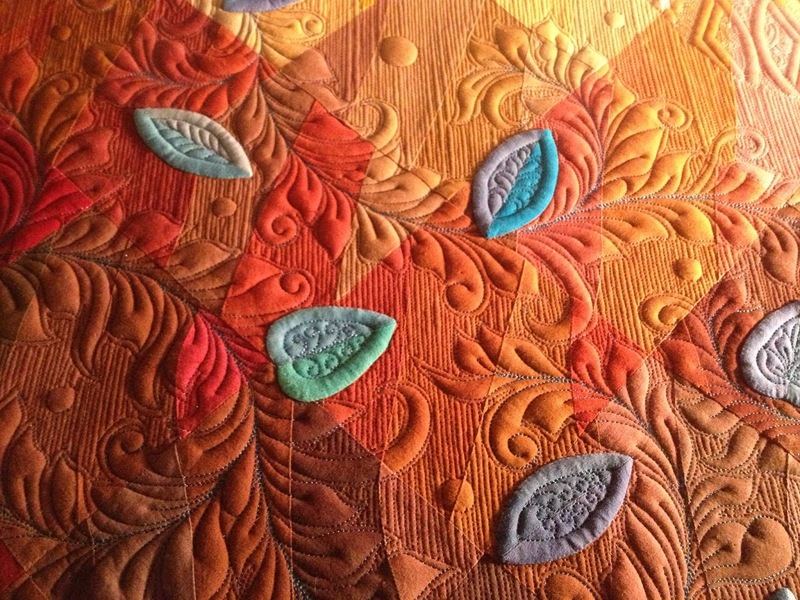 It is hard to do dedicated quilting, though, when all my kids are home. The distractions are many, and my concentration is not as focused as I'd like. 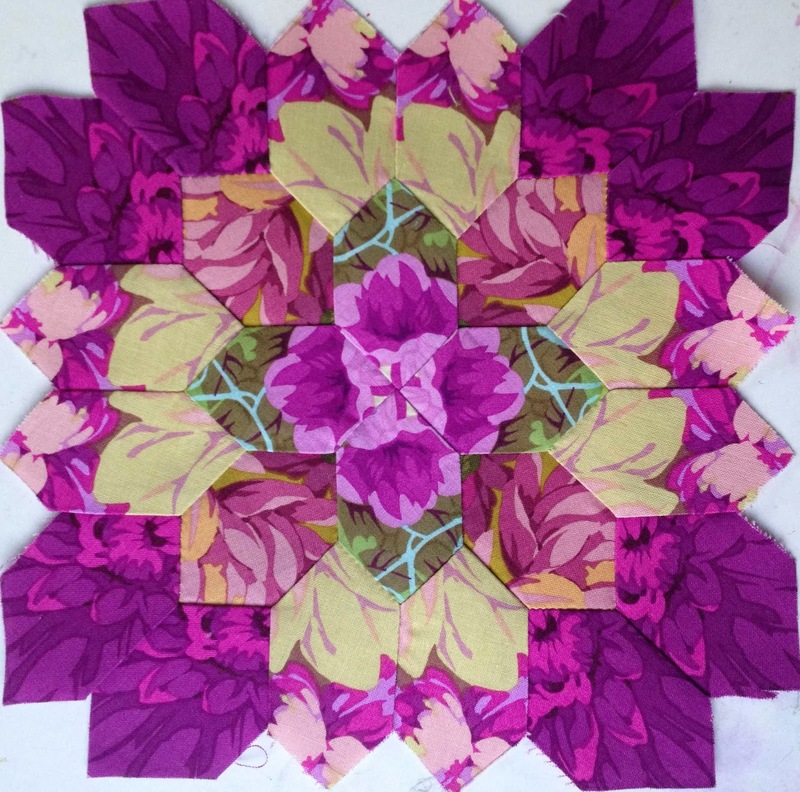 I have done a little, but I have spent more time trying to work on a couple other projects, as well as ponder the design that I will use on Carol's next quilt, shown here. 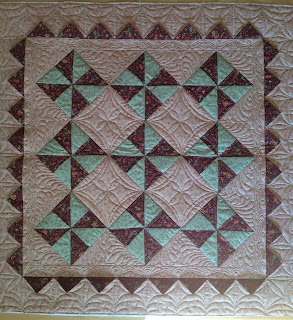 It is all hand pieced, and what the border fails to show is a 4 or 6" outer border. 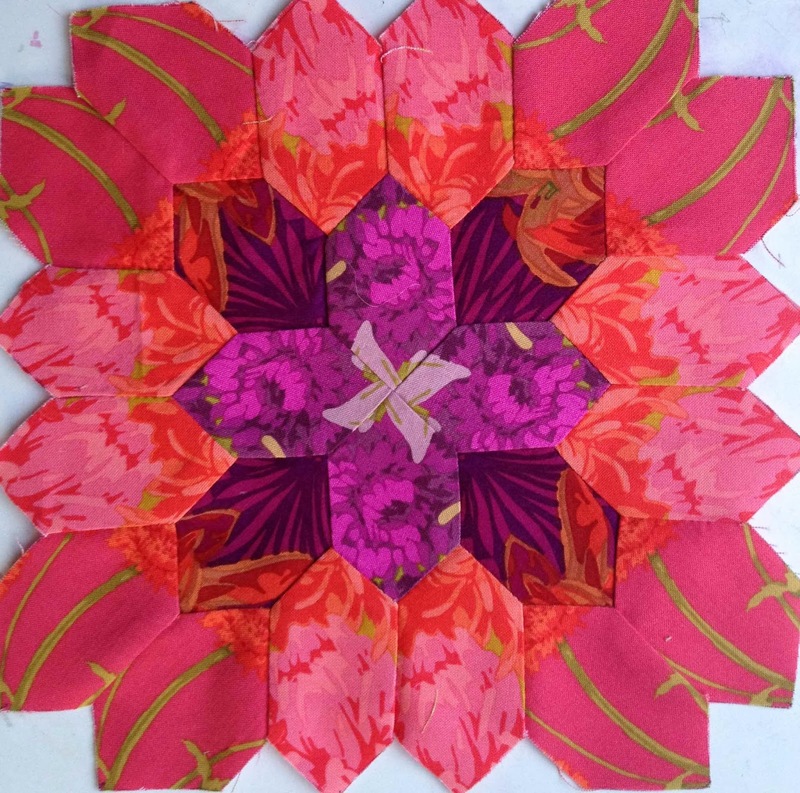 I will start on the quilting of this in just a couple weeks, but it has most certainly taxed my creative brain for what to do! 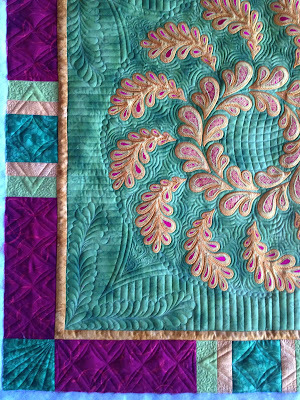 The white is a fantastic way to set off the colored blocks, but it is proving quite a challenge with regards to how it is to be quilted. As a distraction, I decided to photograph my blocks like this that I have pieced. I started hand piecing mine on my trip to Houston last month. I missed my flight in Newark and spent the night sitting in the airport so I got a couple of them done then. Though I haven't measured, I think I am actually making mine smaller than Carol's quilt that started all this nonsense. 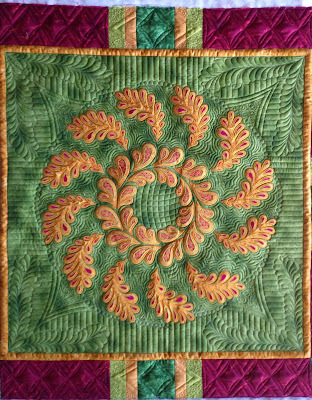 With the champagne silk outer border, they finish about 11" square. So far, I have 7 nearly done, one more being pieced, and a couple more cut out. Because the pieced are all fussy-cut, they take quite a while just to cut out the 24 printed pieces. I have 8 to 10 large scale prints that I am using for these blocks. I have the Foxgloves in 3 colorways, and I just love them. I got a yard of something at Houston which coordinates well, but it turns out to never have but 3 repeats! I cannot imagine a print that large scale that there are only 3 repeats in a yard. I have used it for a couple blocks where you can get a 4th piece out of a close print, just not exact, but this piece will never work for the outer areas that need 8 pieces. They are all in my favorite colors...purple, chartreuse, aqua and hints or orange. Don't ask how they will all coordinate together. That is a question for which I have no answer. Ultimately, I think that I need 25 blocks. I am hoping that when I get a few more, I will formulate a plan to either make so many that have green outers or so many that have orange centers, etc...or to just go completely random. Time will tell how that pans out. In the mean time, they are keeping me busy in the evenings, when I am not hand stitching a show quilt binding or beading on that particular quilt. I like to have a small take-along project for when I visit my mom, or take my daughter to a tumbling class. Bringing the silk quilt that I am binding there is impractical. This next block is my favorite so far. I LOVE this deep russet orange, combined with the purple and green. I will definitely make a few more blocks in these. Heck, in order to make 25 I will make many more in all color combinations. I'm not even near the halfway point. This didn't photograph true to color. The middle that has beigh-ish leaves is really a bright, pretty green. 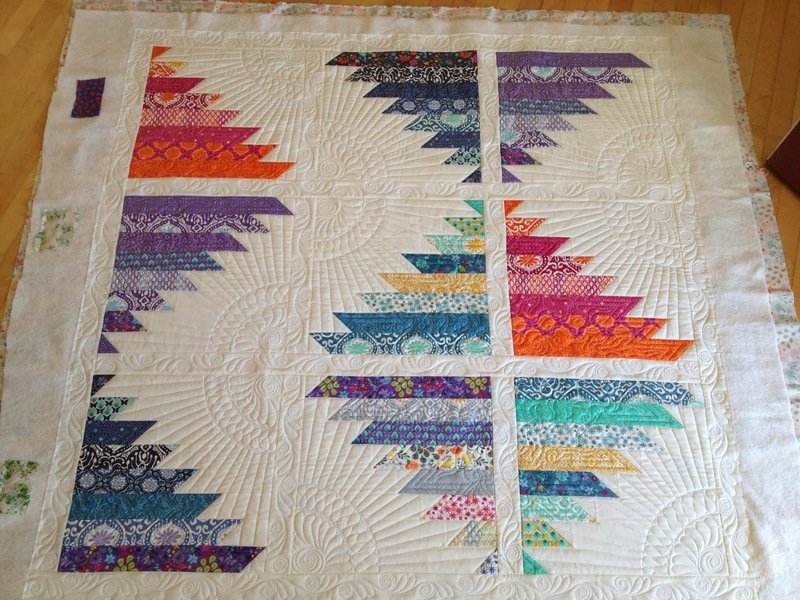 Unlike Carol's blocks, I have been planning all along to have mine set on point. In my color choices, I have been attempting to make the 4 pieces at the points be more dominant if possible. It's not always easy, but that is the goal. I am sure you have also noticed that the blocks do not have squares in the corners yet either. I will determine the color/fabric for them after I see how each is oriented in the final quilt layout. It may need some commonality to bring cohesion. This fabric may be another silk; I haven't fully decided. Only a couple of the blocks have the silk triangles stitched in. It is a little fussy to do, but nothing I can't handle. I am also planning to set the blocks alternating with plain blocks of the champagne silk. This is where I will get to showoff pretty quilting. 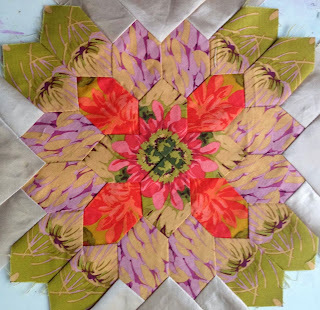 After this fun distraction, I am no further along on working out the quilting plan for Carol's quilt, which she has been so patient waiting for. Back to work for me! I have loaded up my applique quilt for a few days of quilting. Like all my own projects, it will get a few days in order to get it stabilized, and then I will have to move it off in order to get some other quilts finished. All but one of my Christmas commitments are done, unless you count the quilts I say I will make every year as gifts and never actually get to. Maybe next year. PLEASE DO NOT POST TO PINTEREST. These pictures are not your property, and only I have the right to say that it is or is not OK to post them. I will report you this time if I find them posted. Promise. Alright, with the ugliness out there, let's get on to the good stuff. 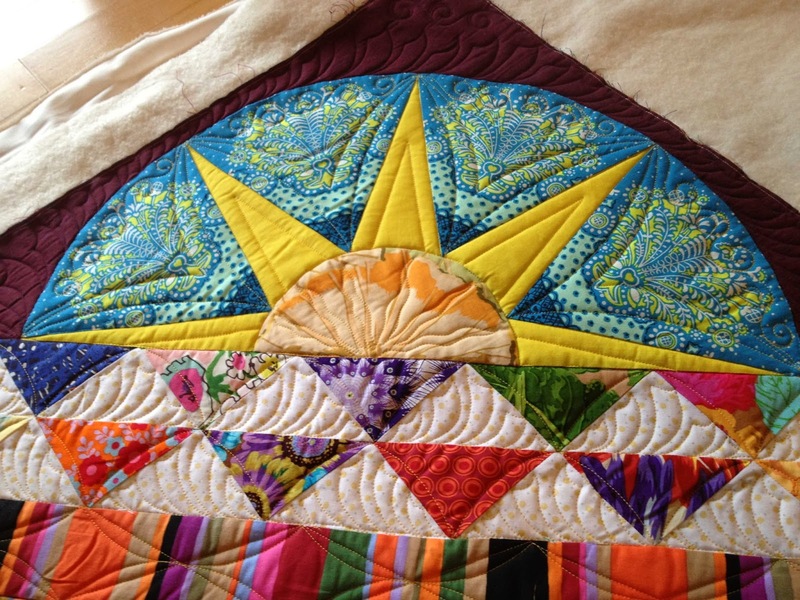 It would appear that the last time I showed a progress shot of this quilt was here, and it was not yet finished. You get the idea though. The other two sides just needed their applique. Fast forward 6 months, the top was finished, and one quilter had a crazy hair to try to finish it before a February 1 deadline in order to get it entered into a show. Time will tell if that is even possible. Said quilter has a full January lineup of client customs, so this holiday time is my window of opportunity. Yikes. I have made it to the center Dahlia. That should in no way imply that I am halfway (ha!). There are sections to rip out and redo. Yea, I do sadly change my mind after the fact all too often. But, having the design defined is a large part of the process, and I have large chunks of this one in my head or on paper. Because there are pretty silk ribbons that go around the outer border of floral applique, I have chosen to quilt them into the center background around the dahlia too. 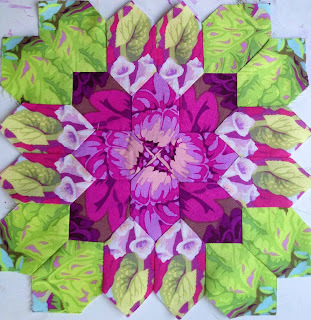 Yesterday, I started to quilt the dahlia too. It has a bit to go still, but is coming. 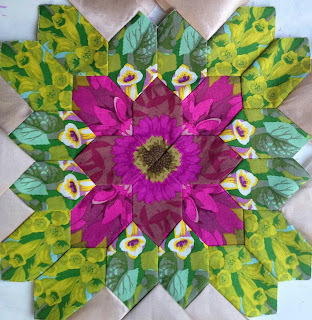 Unfortunately, the dense fill that I chose to place in 3 of the triangles around the dahlia is coming out. I'll do that off-frame. It could take a while. I don't like it and need an alternative. The remainder of the dahlia will get quilting that is more floral - petals to be exact. I love to intermix different textures, but it is a big flower and should read as a flower. 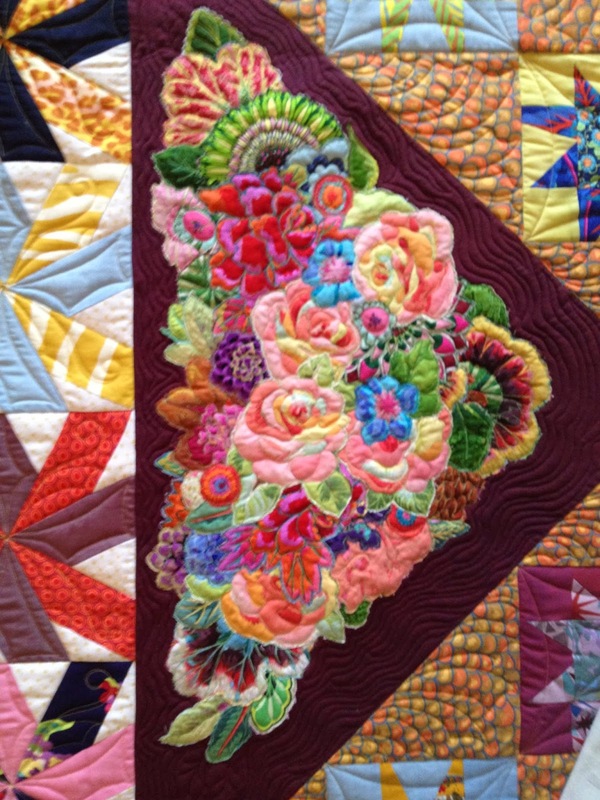 Afterall, this quilt is little more than a big flower garden. For those of you that are curious, I am using a Hobbs 80/20 batting with a QD wool over that. 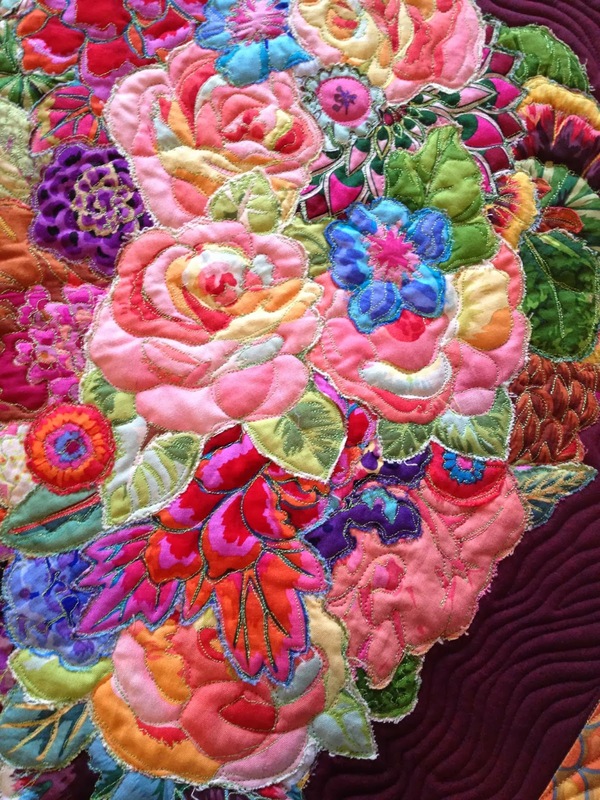 This is the reason that such dense quilting will still yield lovely loft beneath the appliques. I do not like to put a lot of effort into hand appliqueing only to have the appliques look flat and wrinkled, as they will with only a cotton batting. 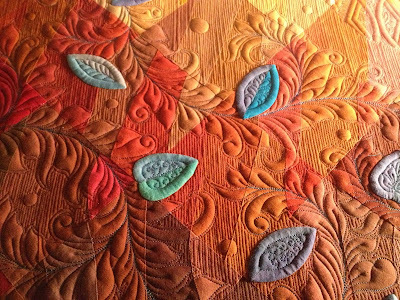 I am also very painstakingly ditch quilting every applique and line that I want to look crisp with a clear thread. 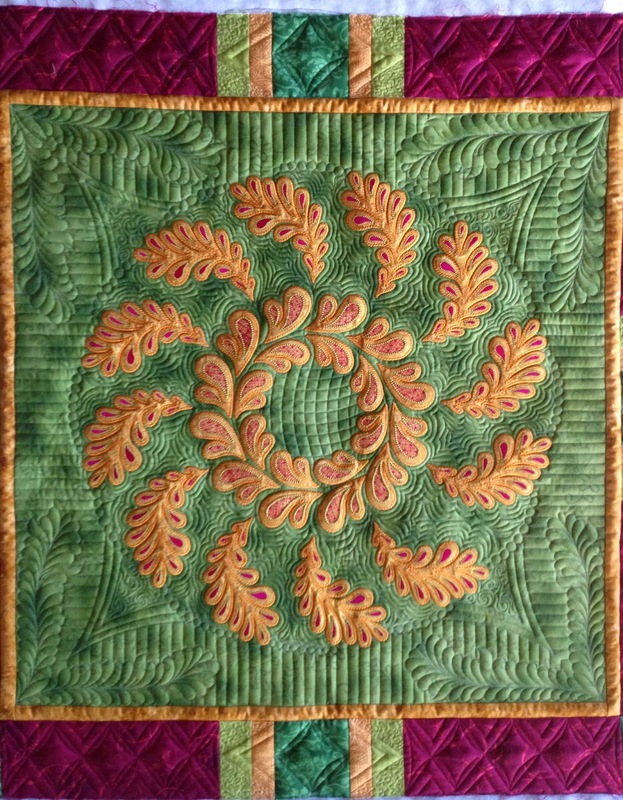 The other quilting on the quilt is stitched with a variety of silk100 threads - gold, ivory, pink, green and brown. I recently quilted a couple of machine embroidered-applique quilts. 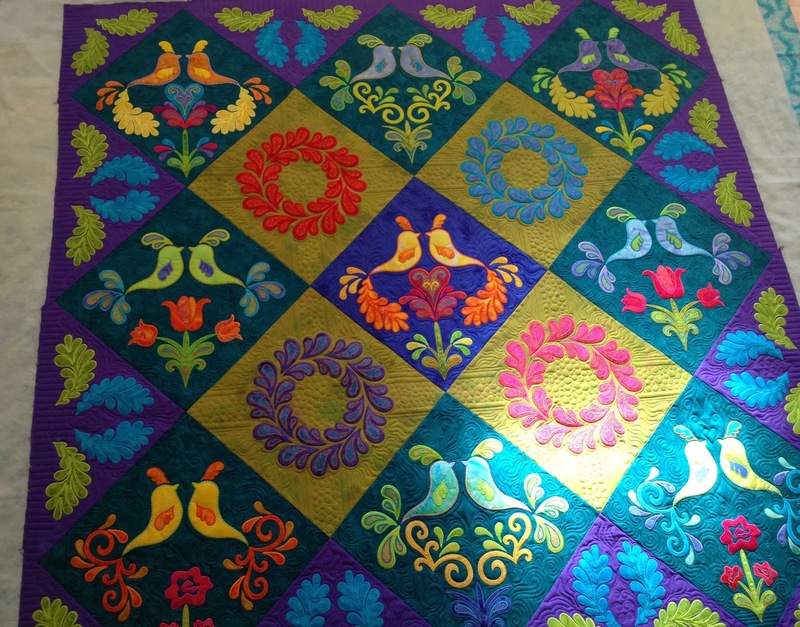 This first one is a small wall-hanging, about 36" square (yea, I cut off the side borders in the picture). It has wool batting, and mostly Invisifil thread. 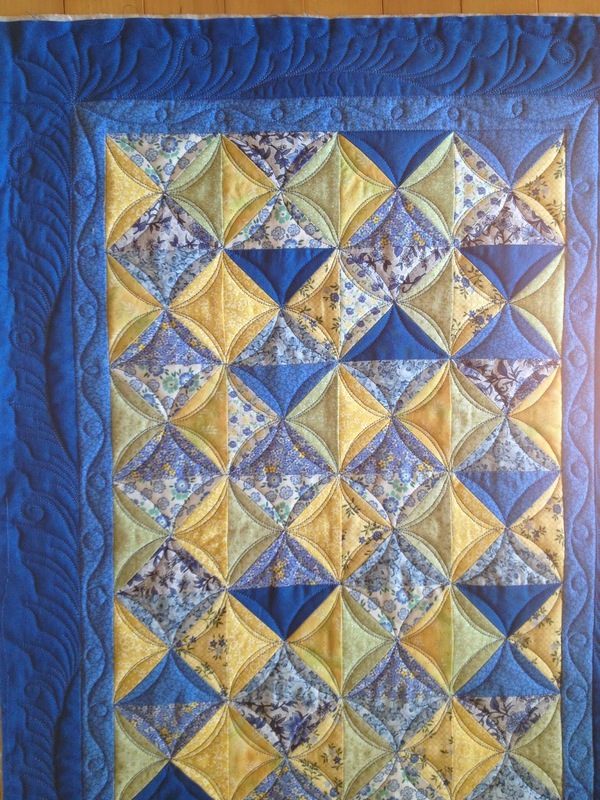 I toyed with using a gold Glide, but waffled on that decision the day I loaded the quilt. I think that was my personal choice over-riding the preference of the client, who favors thinner, non-showing threads. 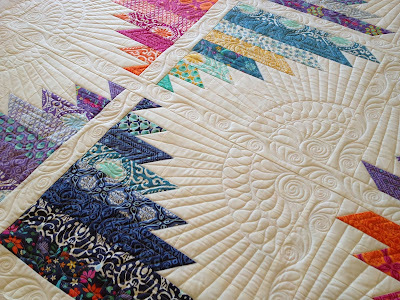 The Invisifil sinks into the top, becoming mostly invisible, but for this type of quilt, which has a thick tear-away stabilizer near the appliques, the thinner, less robust thread proved to be a complete pain in the neck. It broke about a zillion times on me to the tune of stop, knot, bury, rethread, repeat... Live and learn! Given the size of the top, there wasn't too much of my usual designing of secondary patterns. Those require more space. On the border, I pulled out a cranberry Glide thread because that was the best match. The border is mostly geometric. 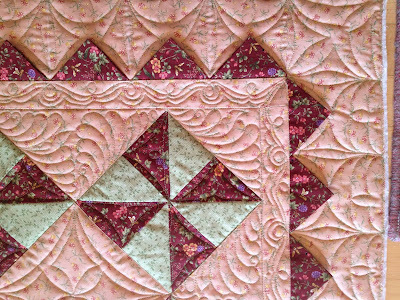 Sometimes the borders that are not very wide, and have piecings like this one does prove to be harder to design for. 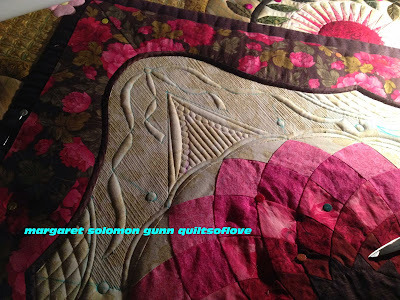 Here is a second quilt. It is in the vicinity of 62". It is another colorful applique by machine embroidery quilt. This one was even harder to work in secondary designs. 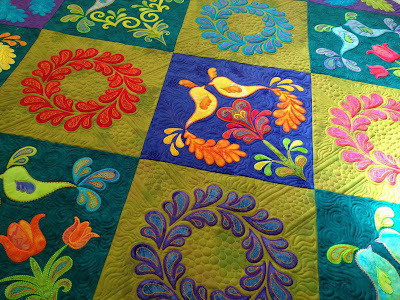 There just isn't space around the appliques to create additional designs. 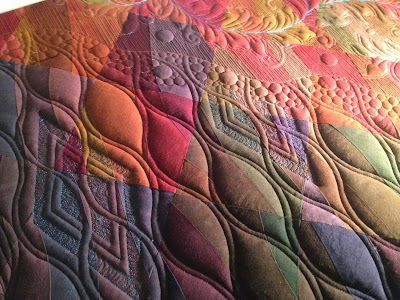 I know that this isn't at the forefront of many other quilters, but when I get a top, I specifically ponder how I can work such things into the quilting. It adds nice visual interest. I spent something like 5-6 hours ditch quilting this beast with clear Monolon thread. 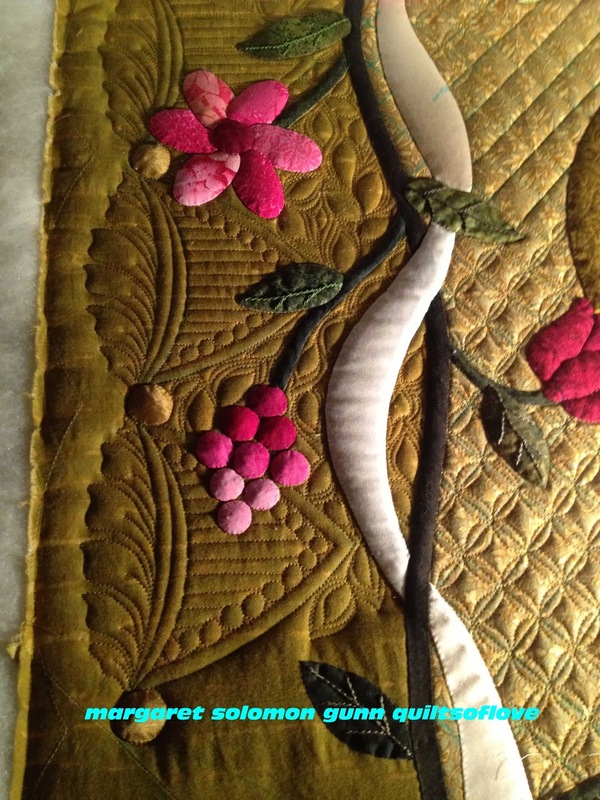 The appliques are enough apart that there's a TON of stop and start on the ditching. It does make all the difference, though, by defining the applique edge. This quilt also has a wool batting, but the loft is sort of lost because the entire top has a layer of a fusible interfacing. I realize the purpose of the interfacing, but it really makes a stiffer top that just does not show the relief of the quilting as well. I chose several different threads...the teal areas got a 50wt So Fine - it matched the best. It's relatively fine and easier to use than the Invisifil. 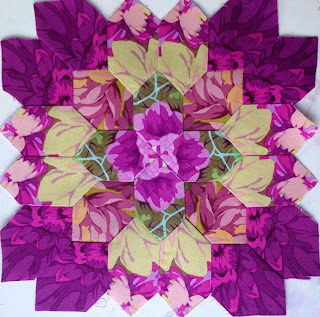 The purple setting triangles are quilted with Glide. It also matches, but shows a small amount of sheen. The gold (or are they green??!) 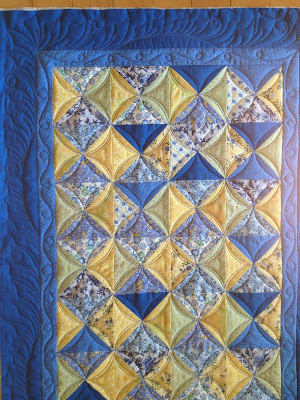 squares are quilted with a tarnished-gold Glide thread. It does show a little, but I think the sheen is pretty because this is the only area I was able to put any design into the quilting. Hopefully the small bit of pebbling is OK. The backgrounds of the birds are all a little different, but the overall fill is fairly consistent from one to the other. 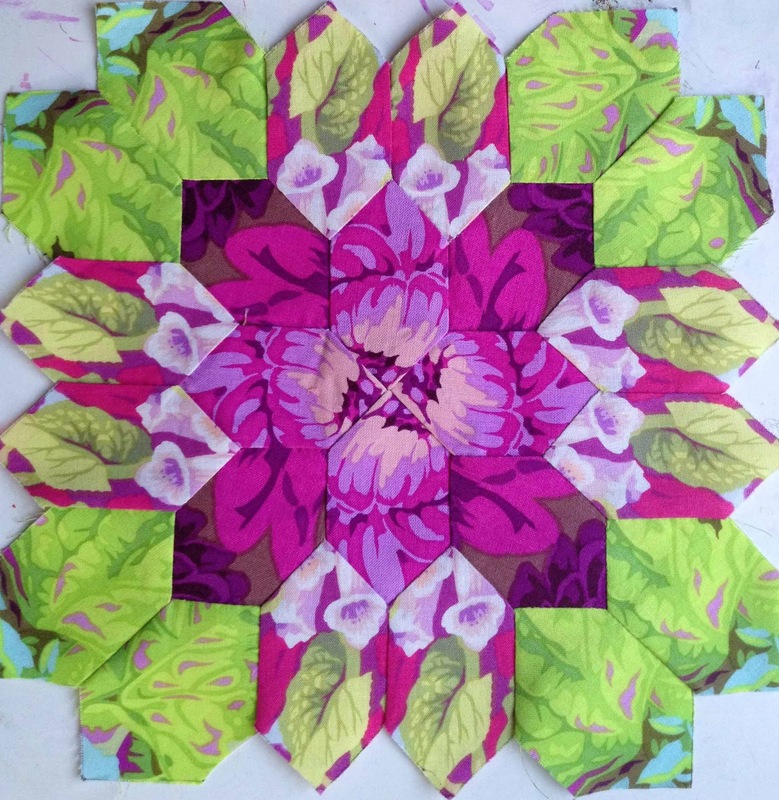 Lastly, here are a couple sneak peeks of a quilt I am butchering quilting. I am far from thrilled with it right now, but I will give it another day. Why does "Modern" have to be so far from my box of skills? Though I have been quilting like a mad-woman lately, I have slacked off in my blogging frequency. 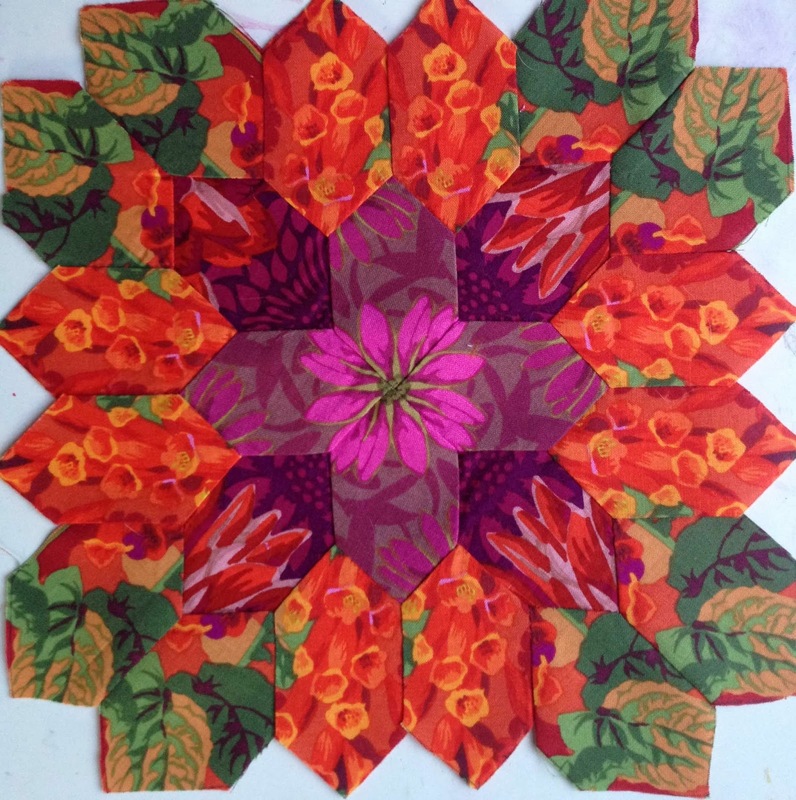 I had a few minutes this morning, so I pulled a couple of client quilts from October to show. 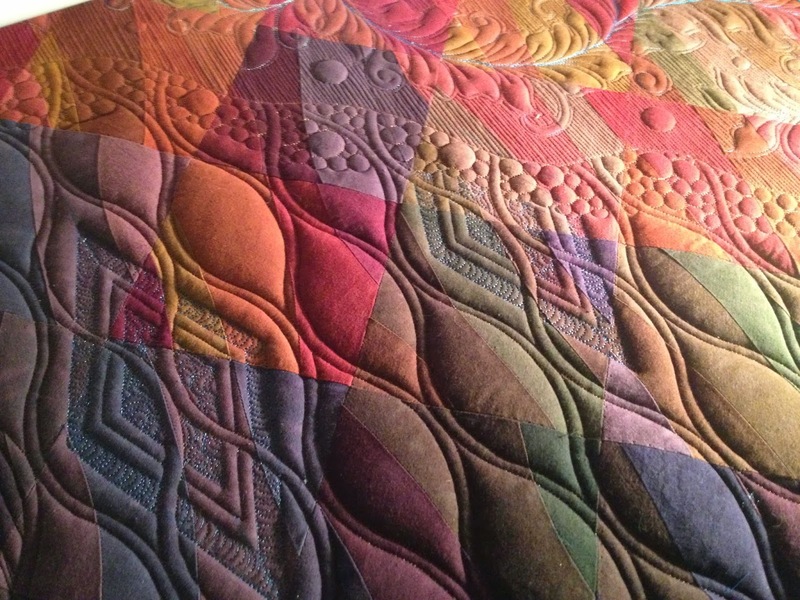 These are all quilted with a single layer of Hobbs 80/20. This is Cuzco, designed by Kate Spain. 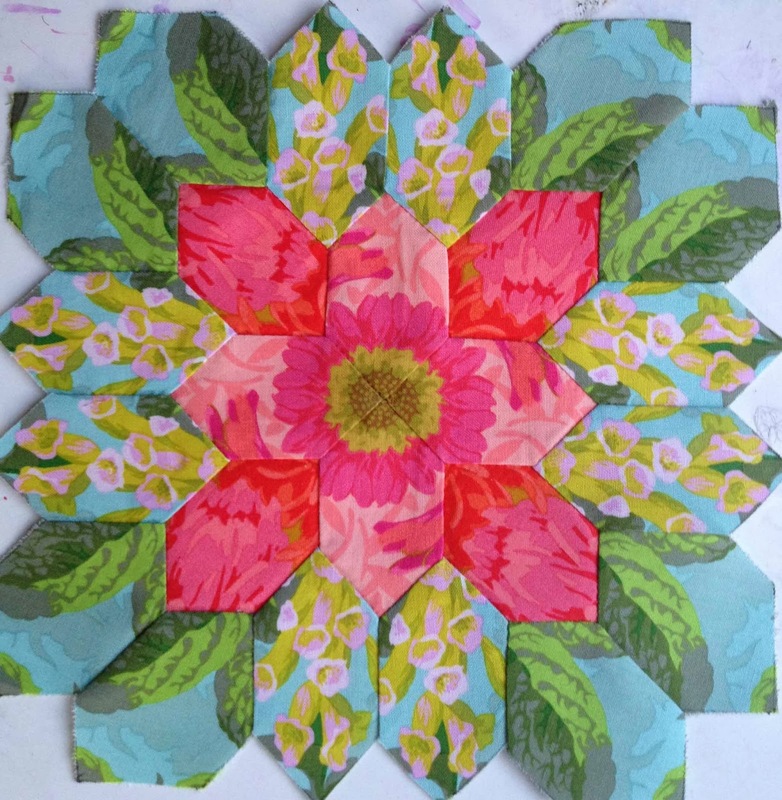 My client made it using Kate's fabrics too, and specifically requested that the quilting resemble how Kate's quilt from spring Market looked (was quilted by somebody else). It is for her daughter, and she likes the Aztec-look which she feels that the rays and curves give. 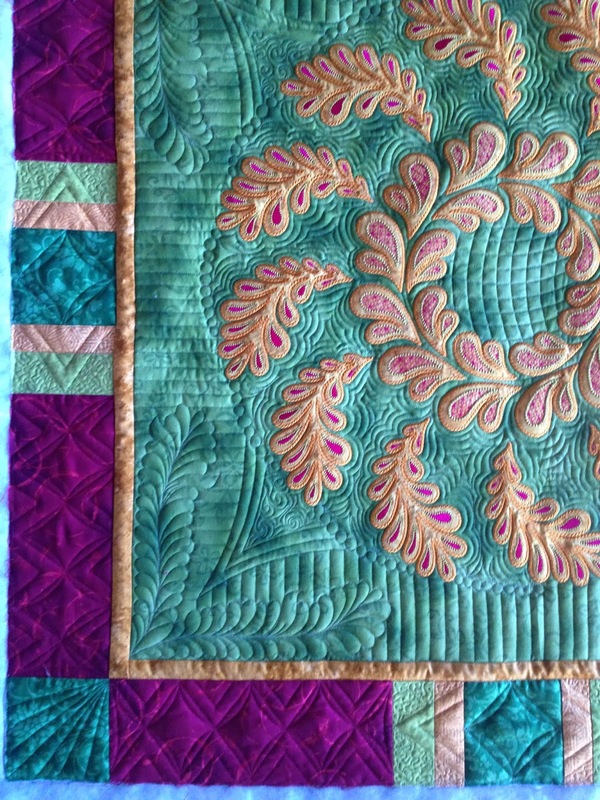 The quilting on the reference quilt is really quite simple, so I did just what she wanted. 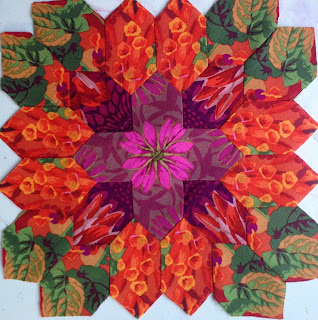 Besides, if I don't have to design the quilting, it takes a chunk of time off of my palate. Nobody was complaining. This 56" (or so) quilt has Omni white thread. I had to mark the rays, but the rest of it is free-handed. It has a good bit of ditch stitching to keep all of the saw-toothed edges pointy. That is just my preference. 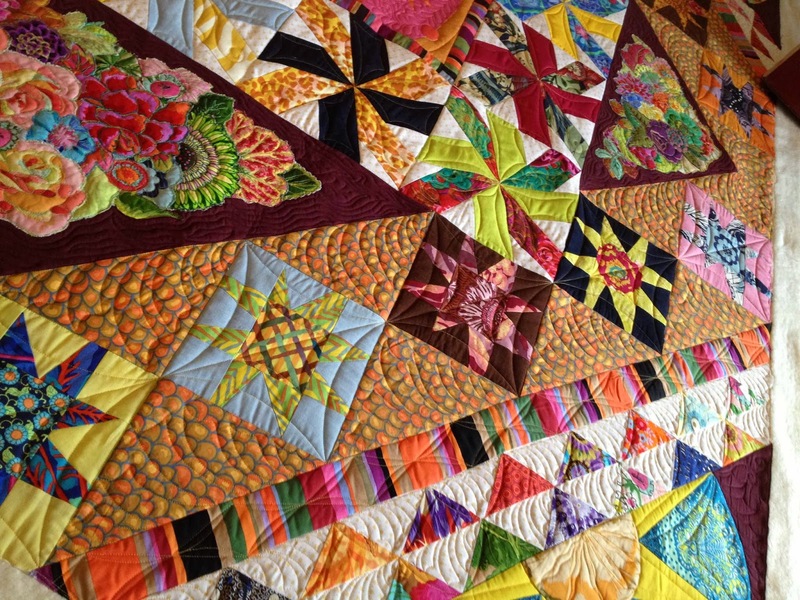 Too many quilters these days omit the ditch quilting to expedite their jobs (or they just don't like doing it). It's a fun, graphic quilt, and the client liked it. I think it comes from a Material Obsession book, and is made with lots of Kaffe and modern fabrics. Though the style is definitely not me, this job certainly affords me the fun of seeing all kinds of styles and designs. 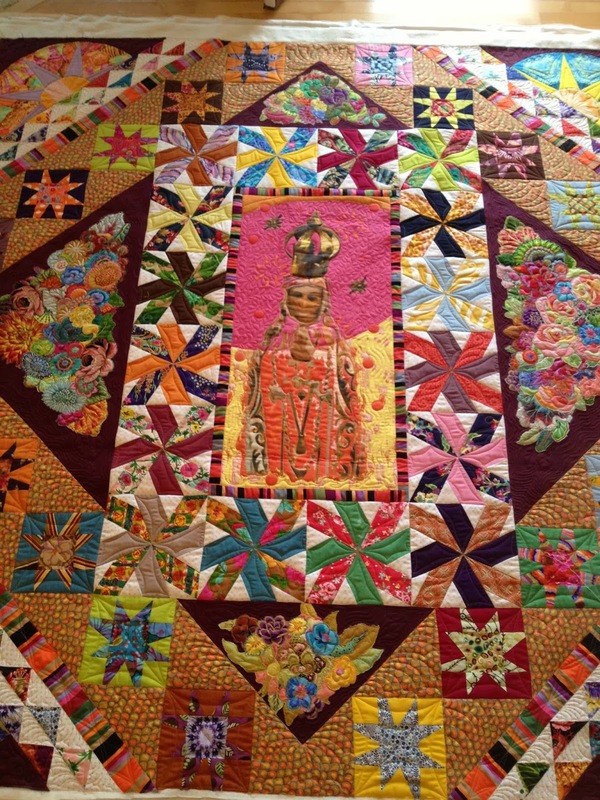 I love the infinite creativity of each and every quilter I work for. This is also made as a gift for someone. It has lots of scrappy-style stars in every possible color palate (the solids are shot cottons, which are just gorgeous up close!). 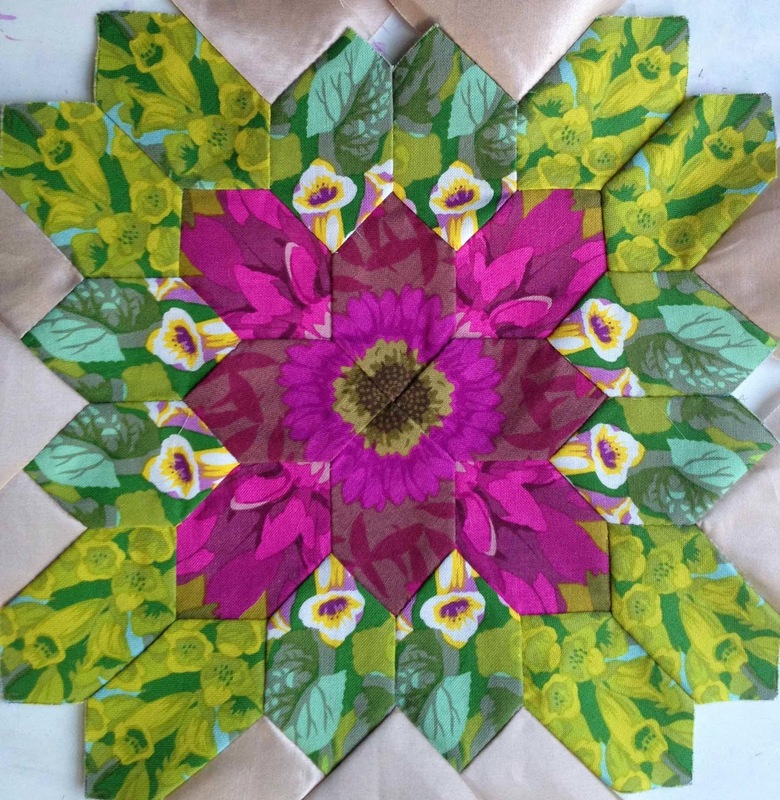 The setting triangles are (below) this assemblage of fussy-cut flowers, fused and machine edge stitched down. Here's a better look. I just further outlined them. And yes, this was a very thick section with the many layers of fusible. 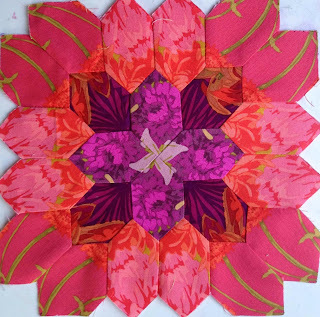 The four corners each have a simple NYB star, each from different fabrics. I made these look like suns (not all were yellow though). The "feathering" as in the triangles above was kept light and playful, rather than the traditional variety. 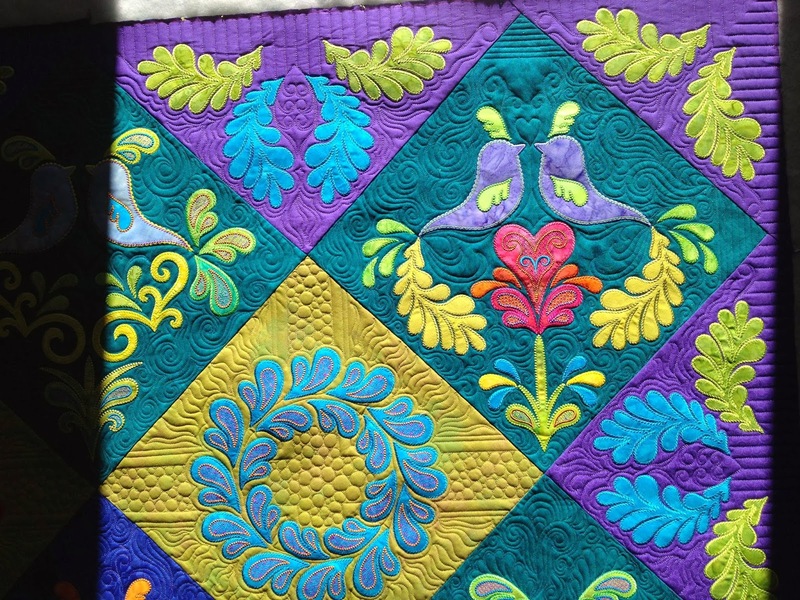 No part of this quilt screams for traditional. I repeated that feather style on the larger triangles below. The scrappy stars have a simple curve treatment. The were harder to decide what to do with because they are scrappy. This center medallion is something I have never seen. I have no idea where the panel comes from. She is interesting. The outlining is partly in the mono-filament, and partly in coordinating threads. 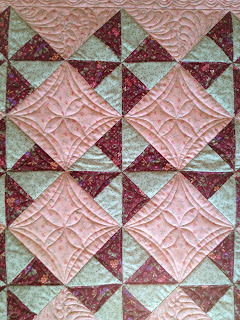 In general, I used a deep peach Omni thread on the majority of the quilt. Much of it was ditch stitched in clear nylon. A very large edge-to-edge is calling right now, so I will leave you with these pictures for now. It is now November, hard to believe. 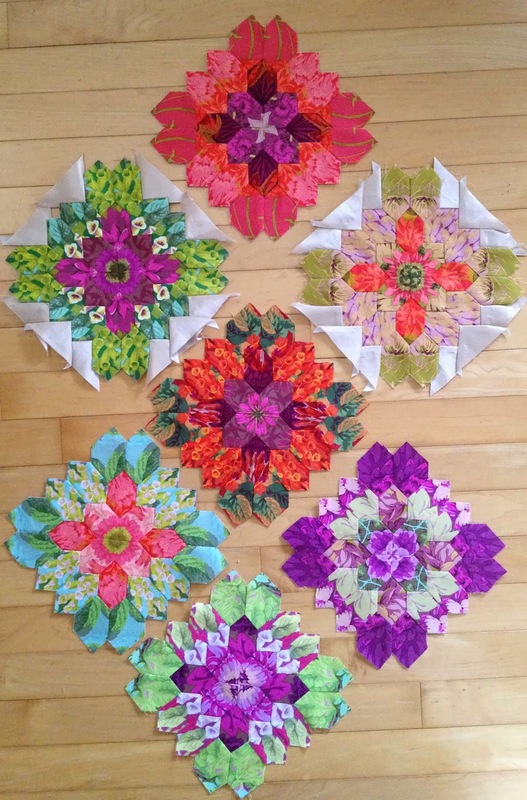 I quilted these table runners last month in my pre-Houston frenzy. This local client had her finger operated on last week, and needed to get them to have them bound before the holidays (hand is now in a cast!). Though it rarely thrills me to have my schedule take the proverbial monkey-wrench, as this and a week in Houston did, there are certain clients I'd do it for any day of the week. 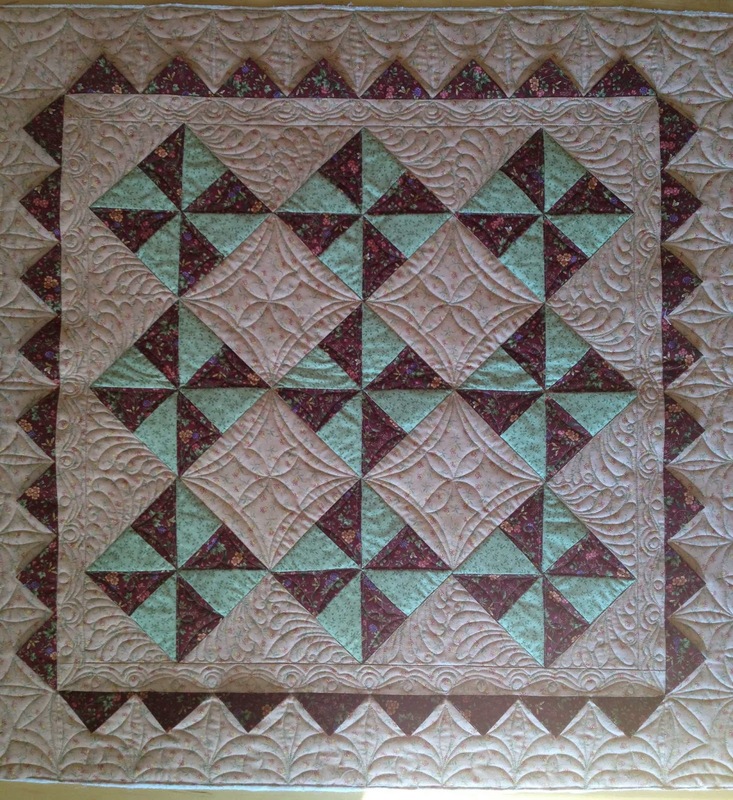 The piecing is simple, and pretty. It just needed quilting that kept it all real. Nothing too dense or over the top was needed. I like quilts like that. I used a blue Glide thread and 80/20 batting. This 36" square table topper has a whole bunch of prairie points. They always make me rethink how to quilt them. My instinct is to stitch those little buggers down, but I assured her I would not! 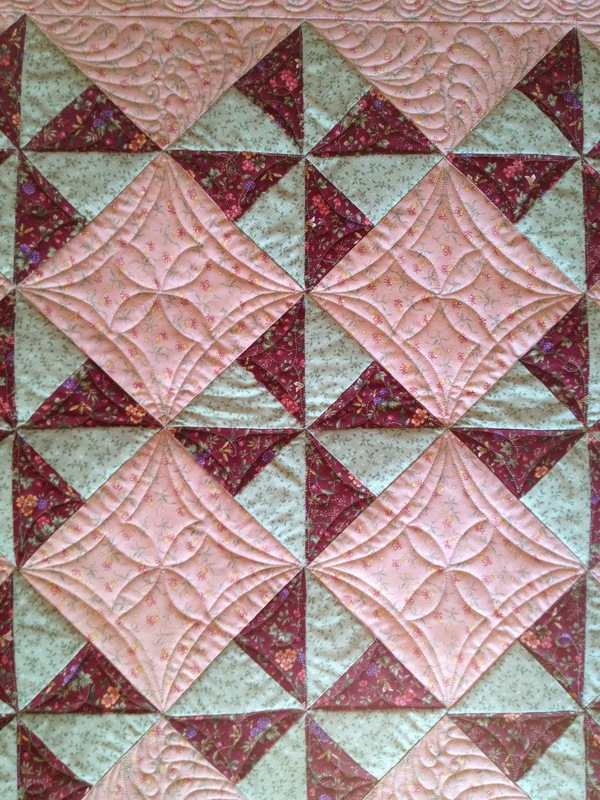 Again, the quilting is simpler, but pretty. There's a little ruler work, and some freehand too. This has a SoFine thread in a peachy color. The last one happened to have a backing with barely enough fabric - it was not enough to bother doing a custom. I knew I'd be constantly cursing the clamps as the machine base hit them. I opted for a pretty and dense Splash panto in a gold Glide thread. It looks nice, and nobody would ever guess it was not what I really wanted to quilt on it. I got home Friday from 6 days in Houston. I was so lucky to have Meander Publishing offer to give me a room for the week in exchange for working in their booth a few days. 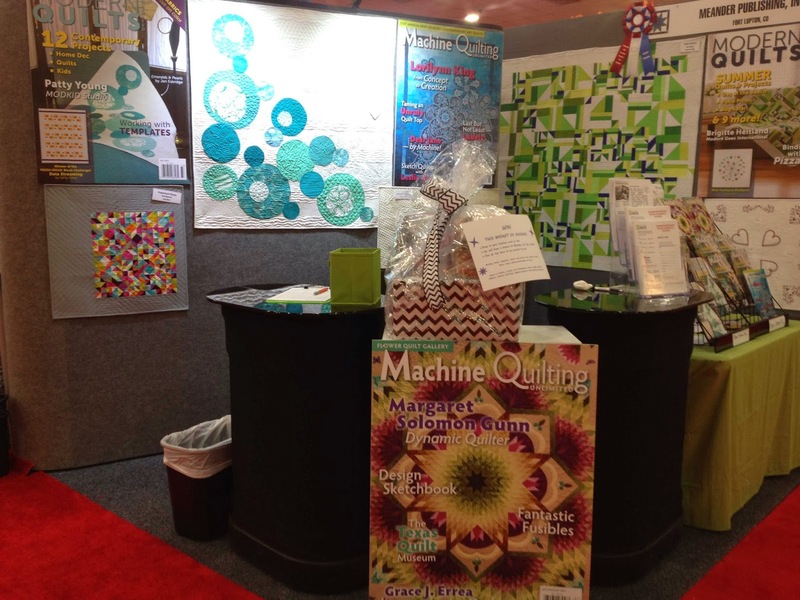 Here's the booth...I just love that my Zen Garden quilt is front and center. How awesome is that?! With a vendor badge, I was able to see the quilt show before Market and Festival opened each day, so I did not have to fight any crowds. 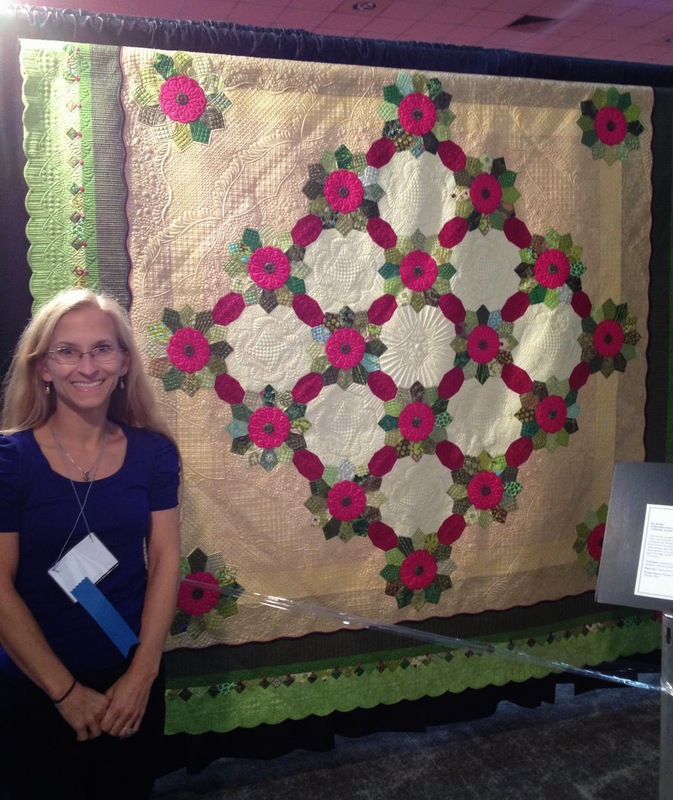 I got to spend time with several great quilters, and meet some others too. The awards ceremony was quite extravagant - guess it should be when nearly 30K is given away to the top 8 winners! 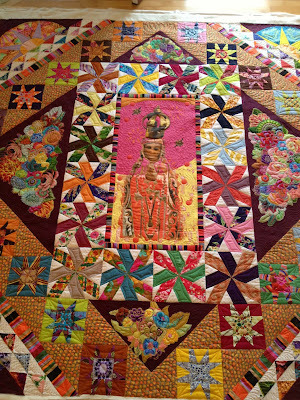 I have many photos from the show, but feel a bit overwhelmed about my feelings of the show, the quilts and the judging. At this time, I think I prefer to just leave things in my head, rather than write thoughts here which some might find controversial. Many of my illusions of this show have been busted. Big Bertha didn't win a ribbon, but then, many other best of show winners from around the country didn't either. It's that kind of show. 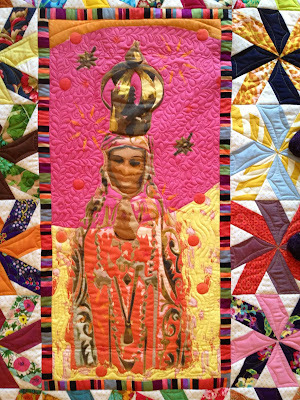 I know that this quilt will have it's day again. It has horrible fold creases that I now need to somehow remove, but otherwise it looked to be in good shape considering they have had it since early August. Life is busy now. I came home to a magazine deadline. Fortunately, that was mostly finished before I left. I am getting back to completing the Christmas orders. Looks like I will probably find myself in the same pickle as last year and having no time to make any of my own Xmas presents. I really need to think about these things in March!